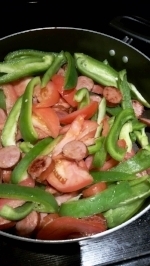 Sausage, Tomato and Bell Pepper Dinner! Salt and pepper to taste. I actually don't salt or pepper this dish. Not sure why. I just like it how it is! 1. Cook rice according to package directions. I usually do this first so I don't forget it! Once you start the rice you are able to let it sit and move on to the next steps! 2.Take sausage out of packages and cut into slices. 3. Throw slices into a skillet on medium high heat to get a nice browning. 4. As those are starting to cook slice up the tomatoes into wedges and the bell peppers into long strips. 5. After sausages have browned toss in the bell peppers and tomatoes. You can do one at a time or both at the same time depending on your preference of how you like your veggies cooked. 6. Turn temperature down to a medium low heat and cover. Let simmer and stir occasionally until tomatoes and bell peppers are tender, or to your liking! 7. Scoop up your rice and serve up your sausage, tomato and bell pepper on top.